this weekend the lovely colette amelia bestowed the mouse a mighty ROAR. 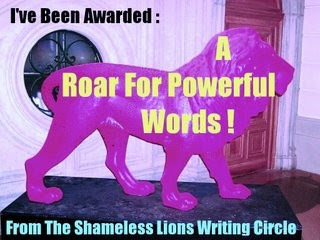 the ROAR award was created by seamus of shameless words to recognize blogs which light our fire! along with creating the ROAR award, seamus is the “lion tamer” for the Shameless Lions Writing Circle. 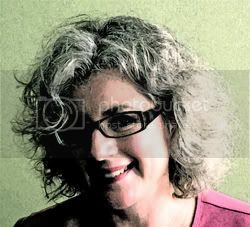 although I am not a member of the esteemed “shameless lions writing circle,” I've been enjoying the wordsmithing talents of various circle members since the first day I dipped my paw into the blogosphere. my frequent nibbles on the fruits of the lions’ literary labors has been stimulating and satisfying. as a ROAR recipient I have to think of three things that I deem necessary for powerful writing and then pay the ROAR forward and pass it on to five fellow bloggers (keeping it to 5 is a bit hard – luckily, many of my favorite blogs are already sporting the handsome lion on their sidebars, so I don't feel the need to reRoar them). mice also have a fondness for elephants (see another mouse tale) this brings me to the next blog which ROARS - the blue elephant. 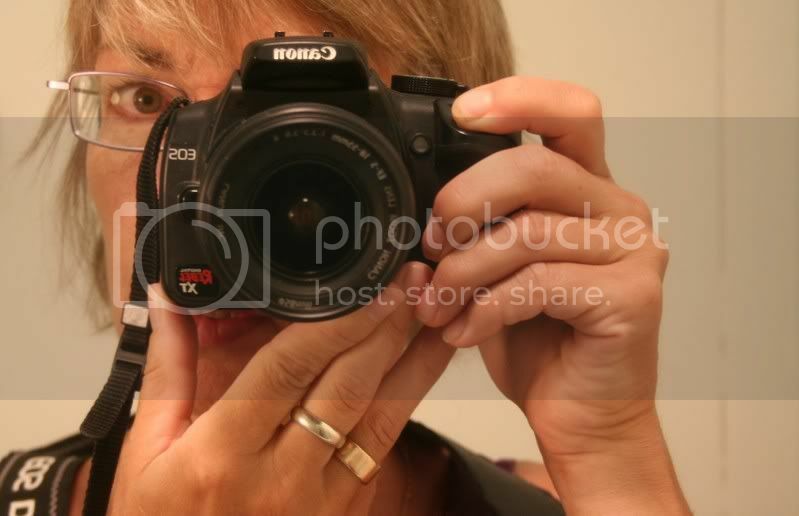 james brings heart, beauty, and poetry to the blogosphere with his words, images and constructions. I just discovered james’ blog in november but from the first post I read (which incidentally was entitled “values for the next president”) I instantly knew the cosmos had lead me to a kindred spirit. the hand of the cosmos was actually in the form of some junk - junk thief that is! I would have never discovered james’ blog had I not already been hooked on the words and wonder of the junk thief (aka ladron de basura). jt is inimitable, irresistible, and divinely incorrigible. lettuce eating is another blog where the writing and images never fail to lives up to the mouse’s criteria of “the 3 I’s” of writing that roars. whatever story lettuce shares – I seem to find a cozy corner of connection and community. in spirit cloth jude writes about the process of “cloth making” - however, the way jude pieces together her words they transcend just describing a process of making some thing and quite often provide beautiful lessons and observations about life. congratulations to all of you -- you ROAR! Oh, you are too kind Kimy -- and there you go with some of your favorite letters and words. I'm glad I officially now know about eight people in Cleveland as a result of meeting you and look forward to actually visiting there again after 12 or so years. Okay, I'll wait until things thaw a bit. And I am so glad that you and the Blue Elephant have crossed paths. What fitting Hindu karma that a mouse and elephant would find so much in common! This is very well deserved, Kimy! Well done! I'm so glad you're roaring! Hey, what a compliment coming from a someone who forever inspires and lifts my heart...thank you Kim! oh well done for you Kimy, and thank you so much for passing it on to me too. I think my blog is inclined to be somewhat trivial in comparison with yours and others, but the compliment and your words mean a lot, thanks. Well done Kimy and thank you so very much for your kind words. I absolutely love the lion piccie at the end of the post. He seems a sleepy kind of softie that wouldn't mind you stroking his mane, although I would do it very, very carefully. I'm going to be a wandering very soon, and in the meantime my computer is a little unwell, so I may not get a chance to pass the roar on until January, but your words mean a lot and I hope to weave some more worlds when I return. jt - guess I just can't letter play! don't let cleveland winter deter you. snow is a fact of life here so things don't shut down. and there's like watching the surfers on the lake in january or february! let - your blog is filled with treasures. verilion - happy wandering and hope your computer gets well soon. Ms. Mouse: I am no longer the invisible and anxiety-provoking "elephant in the room," thanks to you, but, if you don't mind, I want to learn from you and be an elephant no bigger than a mouse -- more portable that way, easier to keep my personal demon (Cf. THE GOLDEN COMPASS) with me wherever I go. On the other hand, you are magnificient, and may, so far as I am concerned, be a mouse as big as a house! Thanks for laurels from Mouse Medicine. Let me fan you with my ears. elephant - you are most welcome. thanks you for the breeze - am working up a sweat these days being a mouse imitating a bee. shameless - thank you for the most kind words regarding the mouse. I blush. 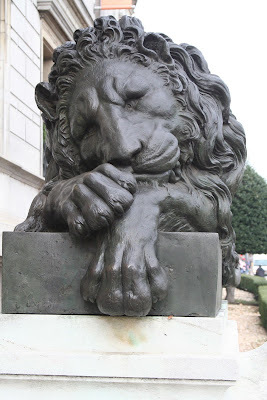 I am honored on your interest to post the picture of the lion - he does seem to be a purrrrrrrrfect guardian lion....I found him quite gentle (the birds loved resting on his mane) but undoubtedly he would be fierce if needed! Wonderful kimy! That's a yes? oh yes shameless that is a yes! sorry for being oblique. I really need to learn to proofread my comments!